Driving along Highway 77, there is a small sign indicating the way to Rubio, Iowa. I nearly miss it, but catch the sign in time to make a sharp turn down what looks to be the main road in this town of 35 people. I pull into Carroll Steinbeck’s driveway. He’s waiting for me, announcing that I have, indeed, found the right spot. Carroll, who will be 95-years-old this November, was born and raised in Rubio, the house he grew up in just across the street from his current home. Familiar with small town Iowa myself, I can see Carroll’s pride in his hometown. 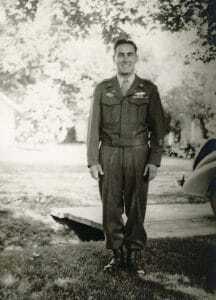 The first time he left home was to study at the University of Iowa, followed shortly to fight in WWII. He ushers me into his home, and we sit down at his dining room table. Carroll has laid out a few pictures of him in uniform from the 1940s for us to look at. While WWII ended 63 years ago, Carroll is still able to recall memories from those days with utter clarity. He joined the army after his sophomore year at the University of Iowa, entering the 66th Division as a mortar gunner. Carroll landed in England on his 21st birthday. While Carroll had several stories to share about his time at war, what I loved hearing the most was his love story, something that doesn’t seem to match our images of war. Carroll came home to Rubio before shipping off to Europe. While home he went on a picnic with friends and met Evelyn, who was studying to be a nurse and also home for a short time before leaving for more training. With a grin, Carroll tells me he had one date with his future wife, but that was all that was needed. They started corresponding while he was overseas, their letters now part of the Stories Worth Telling exhibit. When he realized he was likely to come home safe, he sent Evelyn a proposal from France, and she said yes. Carroll still gripes that he had to wait 20 whole days after coming back home to marry her. Just one date lead to 56 years of marriage. On November 2nd, the University of Iowa is fortunate enough to have Carroll Steinbeck come share his stories with us starting at 2pm in Shambaugh Auditorium at the Main Library. From 3pm to 3:30, there will be a tour of the exhibition Stories Worth Telling: Marking 20 Years of the Greatest Generation with curator, Elizabeth Riordan, and Head of Special Collections Margaret Gamm. This event is free and open to everyone. Come share these stories with us. Stories Worth Telling: Marking 20 Years of “The Greatest Generation” uses pages, photographs and artifacts from the book, The Greatest Generation, which documents the experiences leading to World War II and those who fought in the war. 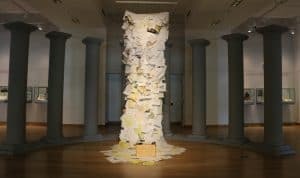 It also uses materials from the African American Museum of Iowa, Iowa Women’s Archives, and the State Historical Society of Iowa. Brokaw’s book, The Greatest Generation, hit the book shelves 20 years ago and became a quick bestseller. 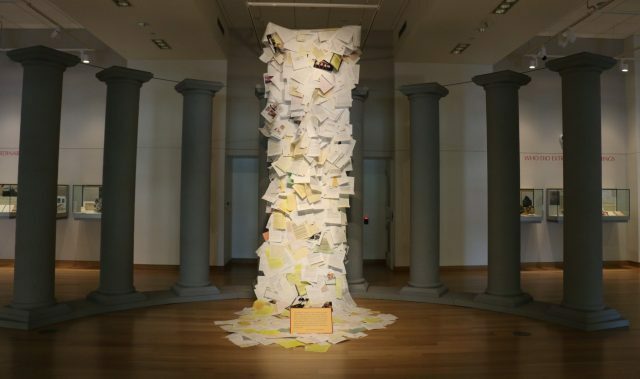 The book stirred something within the memory of American citizens, and soon letters from readers poured into Brokaw’s office, sharing their thoughts and own stories about their time on the battlefield or on the home front. 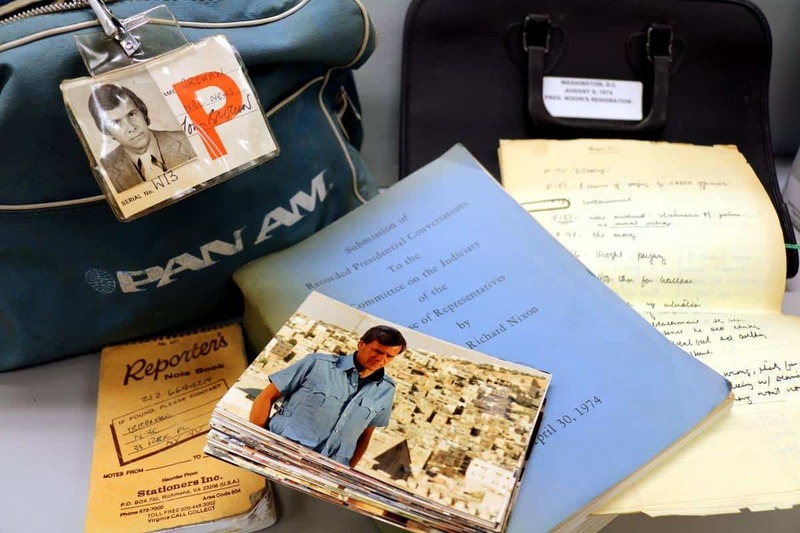 These letters were kept and eventually made their way to the University of Iowa Libraries when Brokaw donated his papers to Special Collections in 2016. 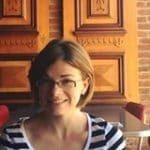 Elizabeth Riordan grew up watching Brokaw, and being a history fanatic herself, she wanted to know more about the collection. So, in 2017 Riordan was hired as the Graduate Research Assistant for the Papers of Tom Brokaw: A Life & Career. 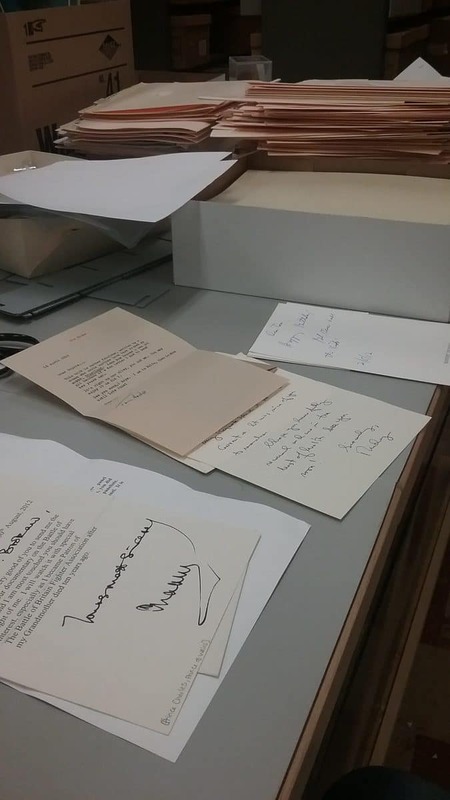 While processing the material, Riordan found a lot of interesting objects, including rocks from the Great Wall of China and poems about the moon landing. However, her favorite part of the collection are the letters from readers that came in after The Greatest Generation was written. And it’s these letters that are the focal point of the exhibit in the Main Gallery. Surrounding the avalanche of letters in the gallery, the “Greatest Generation” unfolds along the walls through quotes from the book, with more stories of people with Iowa connections added along the back wall. 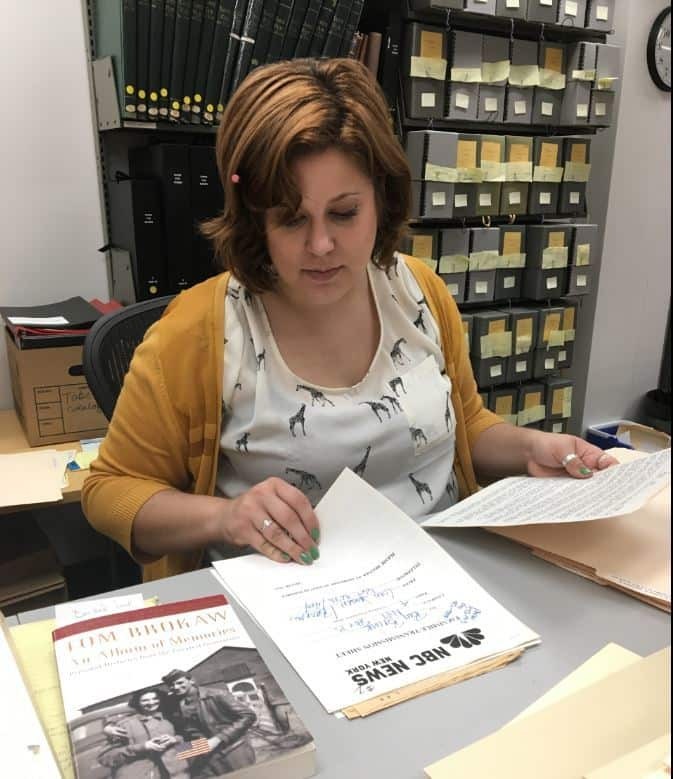 Material from Special Collections, Iowa Women’s Archives, African American Museum of Iowa, and the State Historical Society of Iowa all add a part to the WWII narrative. The exhibit is open to the public from Sept. 7th – Jan. 4, 2019 and visitors can see it Monday- Friday from 9 a.m.-6 p.m., with Tuesday from 9 a.m. to 8 p.m., and on Saturday and Sunday from 1 p.m. – 5 p.m. The exhibit is in the Main Gallery on the first floor of the Main Library. Last fall, Special Collections became the new home for the Tom Brokaw papers, a collection that covers the life and career of a man who was welcomed into the homes of millions of Americans through NBC Today and Nightly News. The collection contains various aspects of his life, from appointment books to photos to letters from the White House. While the collection arrived pretty well organized and in good condition, there was work that needed to be done to get it ready for public viewing. That is where I come in. I was hired in the spring of 2017 as the Graduate Research Assistant to work on the papers of Mr. Brokaw. My job is to make sure all the materials are properly stored in archival containers, sorted for easy access, and described online in a finding aid for anyone who wishes to look. Several people have inquired about seeing the collection and want to know when it will be open for research. Well, at this point in time I am still processing the collection. 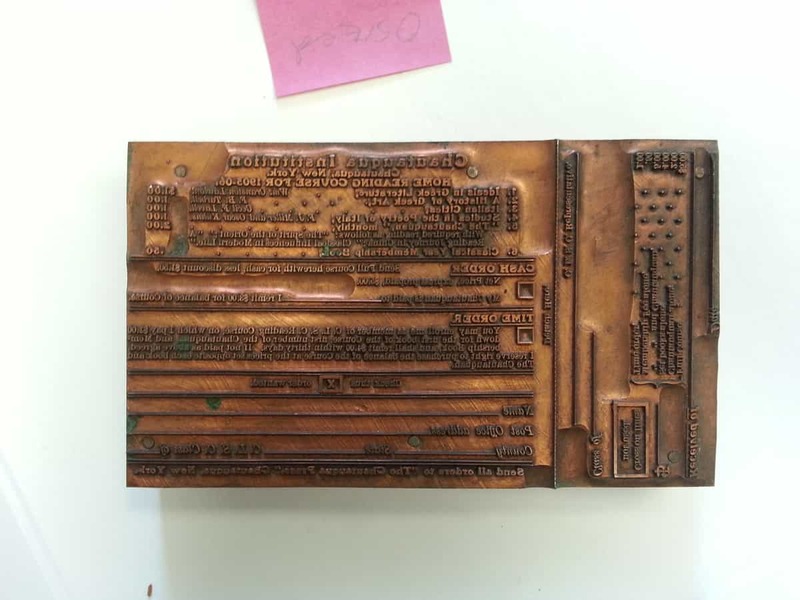 For those of you who are eager to start looking at the collection now, there is a small display of objects in Special Collections’ Reading Room. Until the whole collection is ready, I thought it would be nice to share with those interested what is happening with the collection now. The biggest priority is getting items properly stored in acid-free folders and removing any sticky notes or rusty paperclips from the material. As I have gone through this collection, I have removed hundreds of rusty paperclips and staples that held documents together. 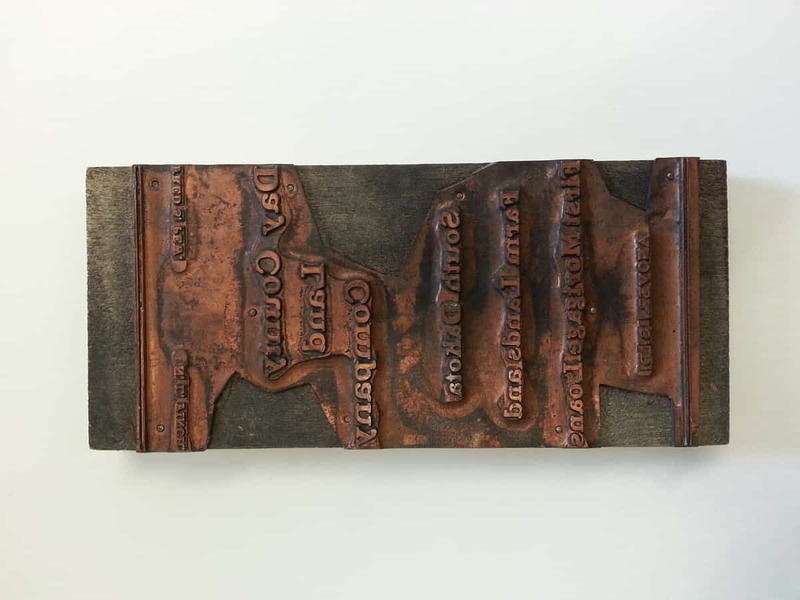 As odd as it sounds, rust can damage more than just metal, but can harm paper material as well. Okay, so that may not seem very glamorous, and may even sound tedious, but it is important. However, the thing I’m most proud of so far is my work with the press badges. 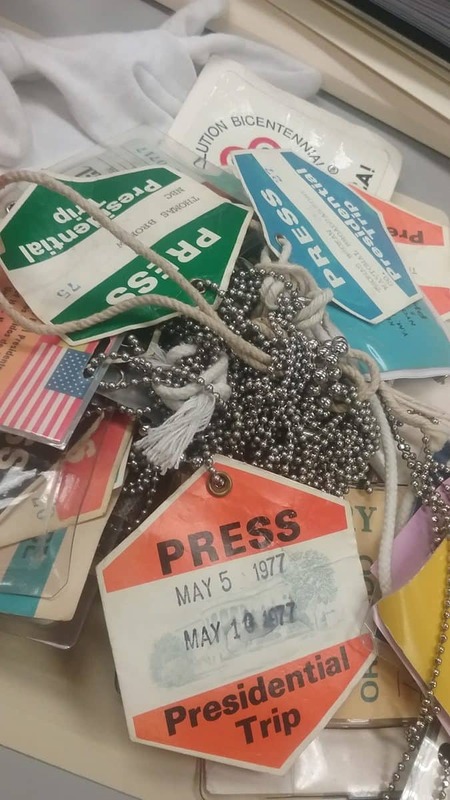 Brokaw saved several of his press badges, some as early as the 1960s up to President Trump’s Inauguration. Many are from history-making events, like the Reagan/Gorbachev meeting. 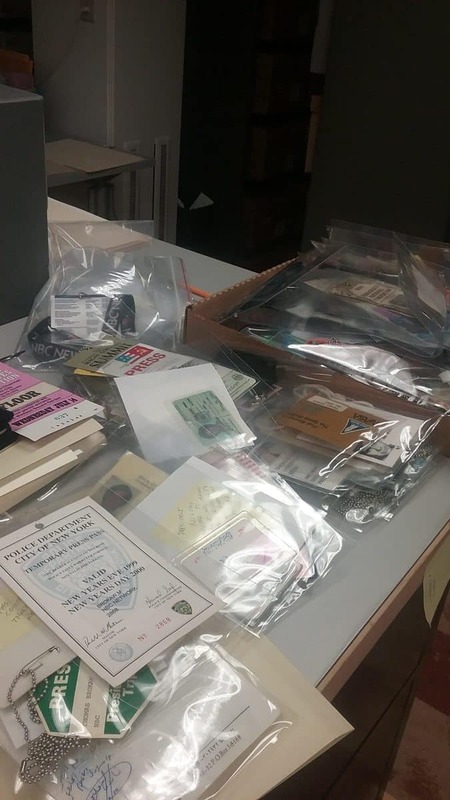 They were originally kept in a Pan-Am bag, and soon the mass of badges morphed into a tangled beast of chains and string. 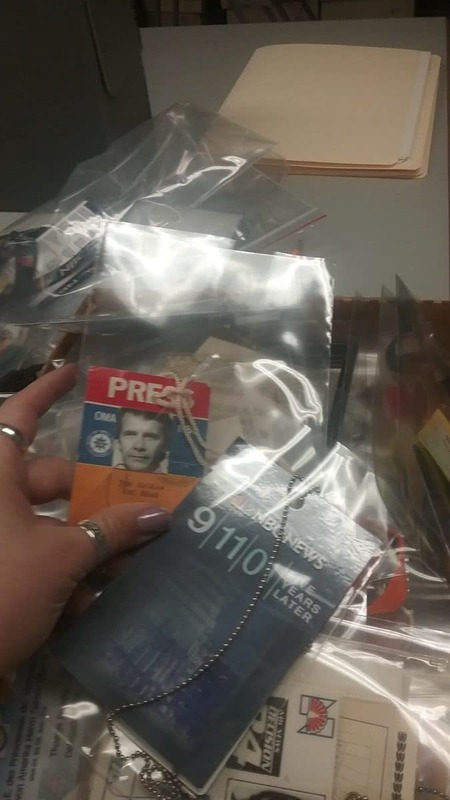 Because of my master skills in detangling my own necklaces at home, it only took about 5 hours to detangle the passes and put them in individually labeled bags. I get that as you read this you may think I’m crazy for being so proud of this, but let me tell you, there is nothing more satisfying than looking at these badges all nicely ordered and in place. I suppose this strange satisfaction means I’m pursuing the right occupation, right? I just finished with correspondence, and there is a cornucopia of names within this collection from Kennedys and Bushes to Redford and Hanks. There were also several letters from people, not famous or wealthy, who wrote Brokaw about his books on the Greatest Generation. Many of them wanted to share their own personal stories about the war, glad to have someone interested in what they had to say. Needless to say I required a box of Kleenex for this portion of processing. These letters of remembrance are tinged with sadness but also pride, they are the “Greatest Generation” after all. What I can say to you now is the collection is worth the wait. This collection will leave you in awe of what one man has seen and reported on in his lifetime, what we as a people have experienced together over the last 50 years. 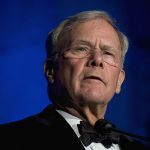 When Brokaw visited the University of Iowa last fall, the United States seemed to be in free-fall with recent events. I had the chance to ask him how he could keep moving forward after seeing and reporting on so much devastation and heartbreak over his expansive career. Without any hesitation, he responded that these moments of devastation are just that, moments. More importantly, he is always amazed at how human beings have the ability to bounce back and keep moving, no matter what. This reverence he has for the human spirit resonates throughout the collection, showing us where we have been as a group and where we can go moving forward. 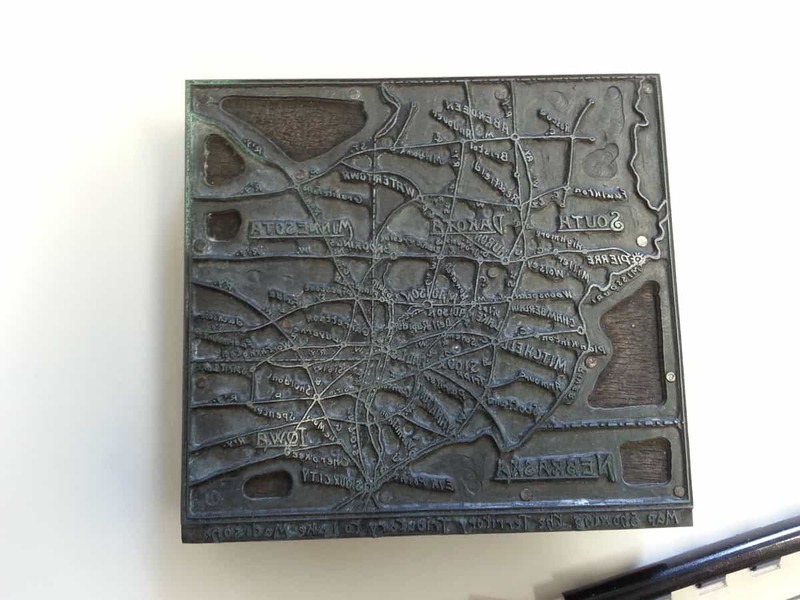 Special Collections recently received several small but hefty boxes of printers’ blocks from the Smith-Zimmermann Heritage Museum in Madison, South Dakota. 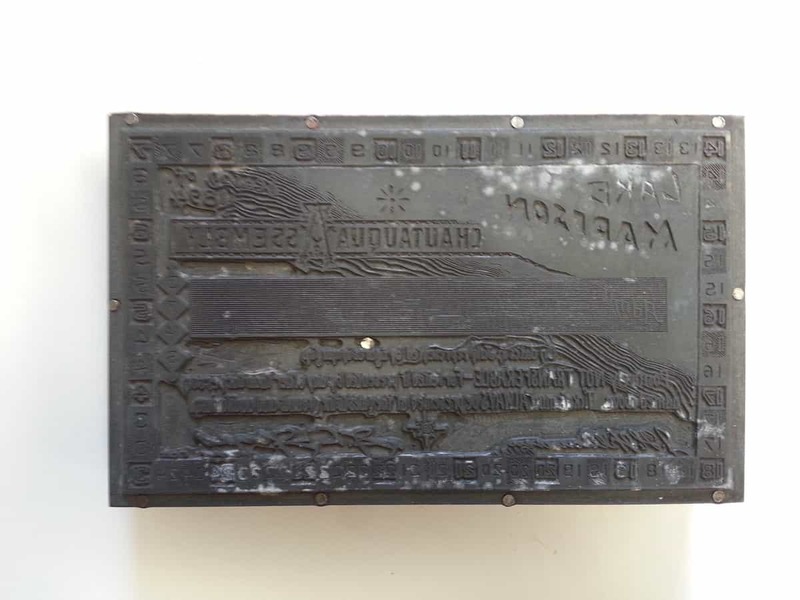 Printers used these heavy metal and wood blocks in the late 19th and early 20th centuries to create promotional flyers and forms for Lake Madison Chautauqua events. One box contained several blocks related to the 1893 Chicago World’s Fair. The Lake Madison Chautauqua Association would have been a natural fit for an exhibitor. Chautauqua organizations sponsored community education programs that usually included lecturers in special topics like religion, astronomy, and history. Many presenters travelled around the country, allowing headliners to grow in fame. 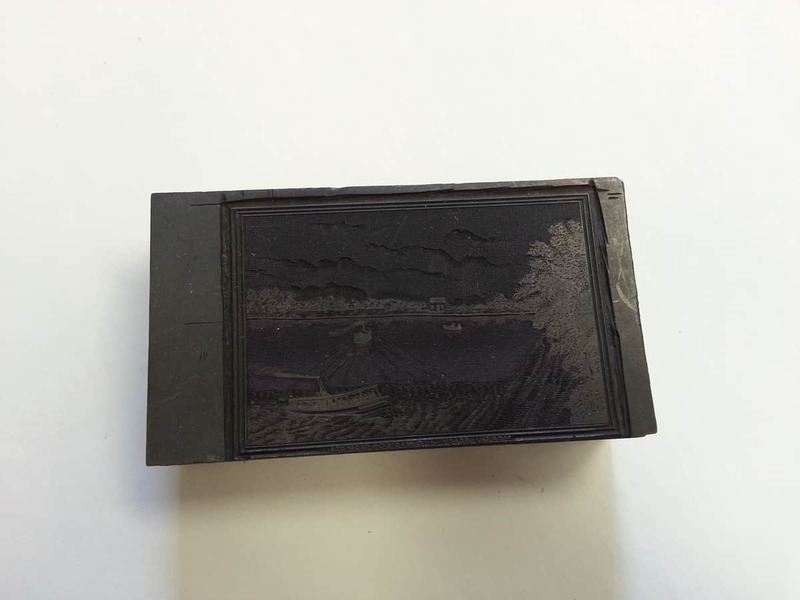 The blocks in the images here were created with a variety of techniques and were meant to be used with different types of ink according to different methods. 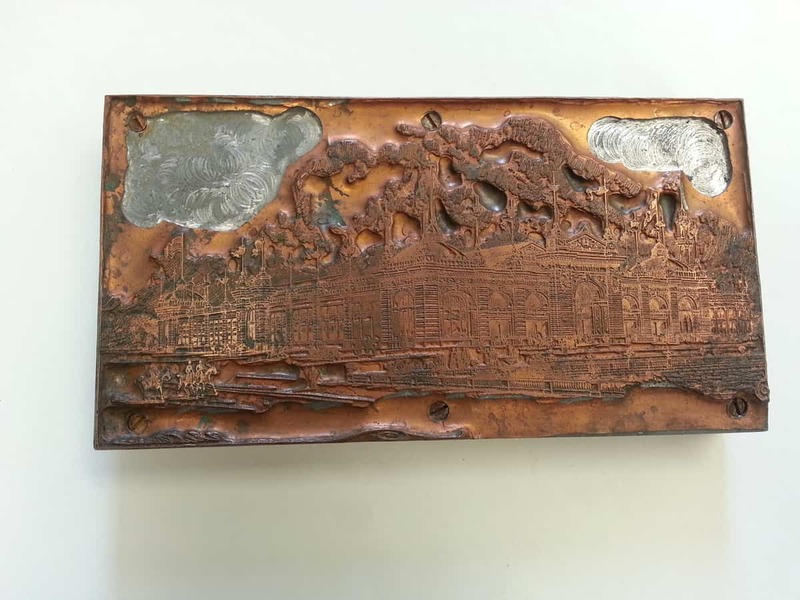 One of the newest types was photogravure, which allowed mass printing of photographic images. In December the Iowa Bibliophiles’ guest speaker will be Arthur Bonfield who will speak about his 60 years of rare book collecting. 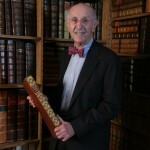 Arthur Bonfield is a Professor at the Iowa Law School and has been collecting books published between 1490 and 1800 for 60 years. He has collected about 1,000 books printed during that period and focuses his collecting on voyages, travels, and geography; English and European history; encyclopedias and dictionaries of the arts and sciences; political philosophy; and herbals. Iowa Women’s Archives on Tumblr highlighted some of the papers of female politicians that are held in the archives. 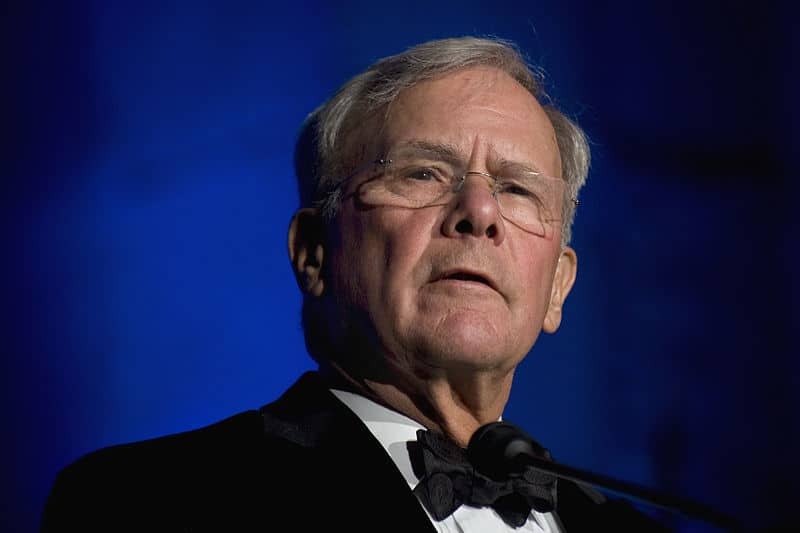 Tom Brokaw, former anchor of the NBC Nightly News and co-anchor of the Today show, attended the UI early in his academic career and has been a longtime Hawkeye supporter. This morning he announced on the Today show that he was donating papers and artifacts representing his 50 year career to UI Libraries. 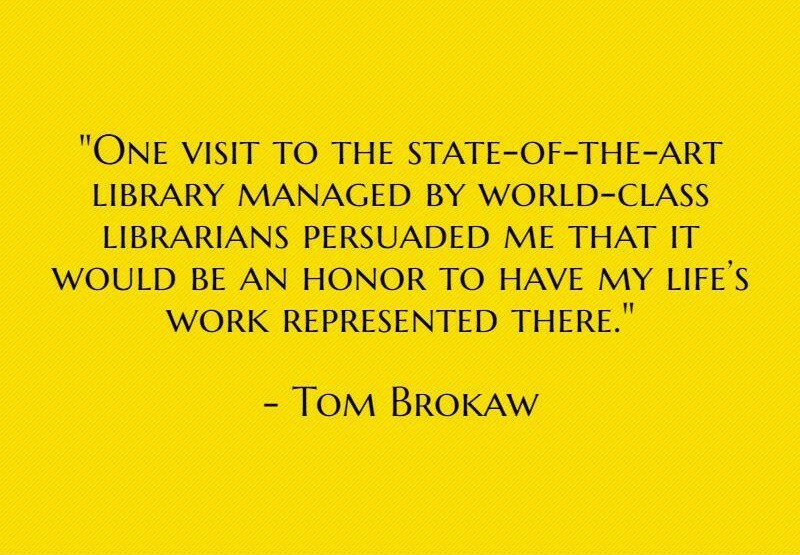 In describing his donation on the Today Show on November 10, 2016, Brokaw praised the UI Libraries and cited the “World Class” library as being one of the reasons for his donation. Stay tuned to this space to learn more about the collection, how to access it, and for future news about Mr. Brokaw.